Plan to join a cookout this Memorial Day weekend and look for something to bring with you? And many of you might agree with me that a perfect fruit for every summer party is the watermelon. Then try this very creative way to serve watermelon! 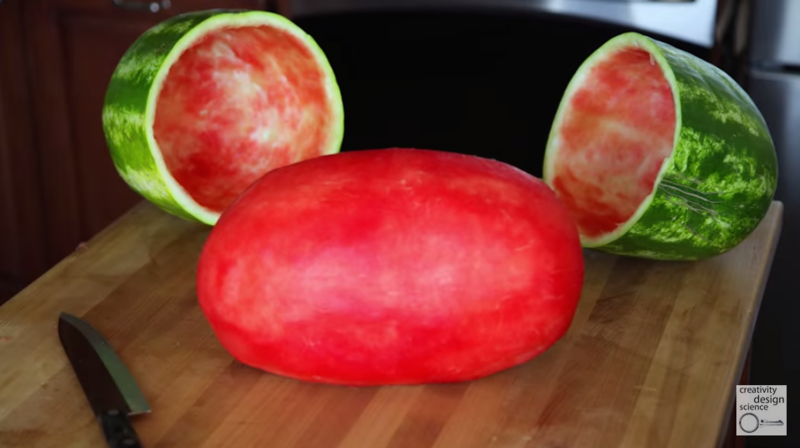 Mark Rober, a former NASA engineer, used his pedigree for the greater good of teaching you how to impress and/or blow some minds of your friends with this trick – perfectly skin watermelon. The emphasis is on the trick here because, despite what your eyes may be telling you, that’s actually not the same watermelon. We all know how to cut watermelon into cubes and slices, but do you want to know how to magically skin watermelon? Here is a video clip to show you how Mark Rober is peeling a watermelon in a perfect way. Hope you can easily learn this and impress your guests at the next party.